Drug overdoses from synthetic opioids like fentanyl skyrocketed in 2016. The U.S. opioid crisis just took another dangerous turn. Last year, synthetic opioids like fentanyl surpassed heroin as the leading cause of drug overdose deaths. That's according to provisional statistics from the Centers for Disease Control and Prevention. The CDC also found the number of overdose deaths caused by synthetic opioids has more than doubled from 2015. 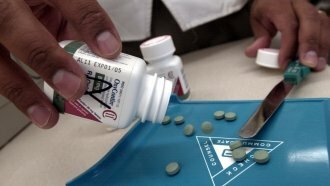 Altogether, the number of opioid overdose deaths in 2016 surpassed the number of deaths caused by the AIDS epidemic at its peak in 1995. One possible driving force behind the shift: the relative ease with which fentanyl can be produced. The base ingredient for heroin comes from the poppy flower. Fentanyl is synthetic — no crops needed. Much of the fentanyl that comes to the U.S. is made in China. Until 2015 the drug was largely unregulated, and recently imposed bans haven't stopped the flow of drugs. In February, the U.S.-China Economic and Security Review Commission called China a "global source of illicit fentanyl." The commission notes that much of the country's pharmaceutical industry is poorly regulated and monitored. There is some good news, though. Earlier this year, the CDC found that in 2015 the number of opioid prescriptions fell for the first time since the epidemic began. Oftentimes prescription drugs act as a gateway to stronger, illegal opioids like heroin. Lowering the number of prescriptions might help slow the spread of the epidemic.